After faffing around in Trabzon for the morning we made it to Georgia by midday and stopped in at Batumi again to thieve a little internet from the Justice house again – Kim’s passport had made it as far as the UK, but it was still a long way from Baku. We stopped in town one last night so that we could leave the computer with someone to fix, since it had been getting slower and slower for some time now. We had a good local meal in a homely restaurant before buying a big bottle of Georgian beer and spending the rest of the evening on the beach. A late start and a ruined computer. The first rule when it comes to these confounded bundles of wire and plastic is to back up all of your data as often as you can bear to – and DEFINITELY do it before it goes into the repair shop with all of the data on for your round the world trip which you have been working towards for more than 2 years. Through a combination of Georgian incompetence and our own flouting of the rule above meant that we were left with nothing bar a few renamed folders, and a small selection of random files – which had also been renamed to save us from having any idea what they contained. Not a great start to the day – The guy at the shop was going to spend all day trying to recover what he could, so we were stuck in town for another day and spent it at the beach hoping that some of our data would have been spared destruction. We returned to the shop at 7pm to find sorry faces and no more files than before – and yet still we had lost a day on our trip to Baku so we had to press on that evening. The roads were pretty terrible, or so we thought at the time – we did not yet have those of Azerbaijan, or worse still Turkmenistan to compare them to. We were still able to cruise at about 80kph, albeit with Ivor prancing about a little. A four tonne truck getting his groove on makes for tiring driving, particularly at night, so in the small hours when we could take it no more we pulled into a service centre to sleep just west of Tbilisi. With an early(ish) start we pulled back onto some surprising good roads, and made some good progress until just passed Tbilisi at least. 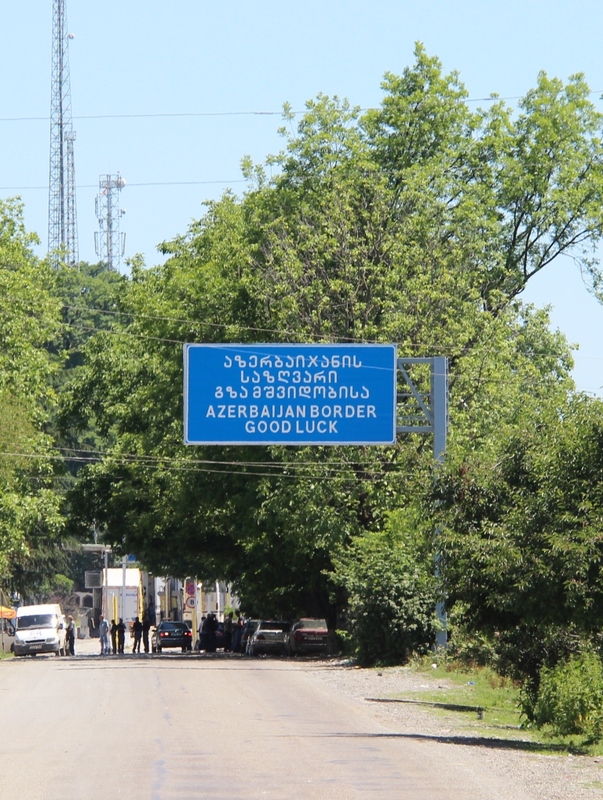 We decided to cross into Azerbaijan via the northern of the two borders since we had learned from travel forums that it was generally the easier with the officials being a little less keen on binding foreigners with red tape… The downside of this lesser used border outpost was that the roads were in disrepair, regularly with dirt patches, and riddled with potholes. The landscape had turned decidedly more arid, and the baking sun was obviously taking its toll on the tarmac. Stopping at the last town for a little currency conversion and some delicious local bread, cooked in a wood fired oven, we eventually rolled up to join the queue for the border just after midday.